Chess has developed such a large body of myth and folklore that sorting fact from fiction is not easy. 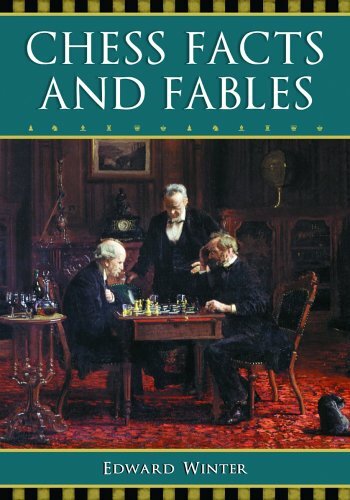 As with Edward Winter's previous volumes in his Chess Notes series Chess Explorations (1996), Kings, Commoners and Knaves (1999) and A Chess Omnibus (2003) this work (from a new publisher) features in-depth research into chess lore, corrections of popular misconceptions, biographical notes on famous players, and authenticated quotations. There is a rich selection of forgotten games, and many items include contributions from the author's correspondents worldwide. Written for the general chess enthusiast and the devotee of chess history, the book is illustrated with more than 220 rare photographs and 122 diagrams of chess positions. It concludes with a bibliography and indexes of players, games and openings, illustrations, and general subjects. jugadores amous, y citas autenticadas. Hay una amplia selección de juegos olvidados, y muchos artículos incluyen contribuciones de los corresponsales del autor en todo el mundo. Escrito para el entusiasta general del ajedrez y el devoto de la historia del ajedrez, el libro está ilustrado con más de 220 fotografías raras y 122 diagramas de posiciones de ajedrez. Concluye con una bibliografía e índices de jugadores, juegos y aperturas, ilustraciones y temas generales.